Home / Latest News / Invitation for the 2nd SPA Fashion Show! Invitation for the 2nd SPA Fashion Show! Are you looking for an afternoon’s entertainment with like minded ladies and some affordable retail therapy, all for a very good cause? 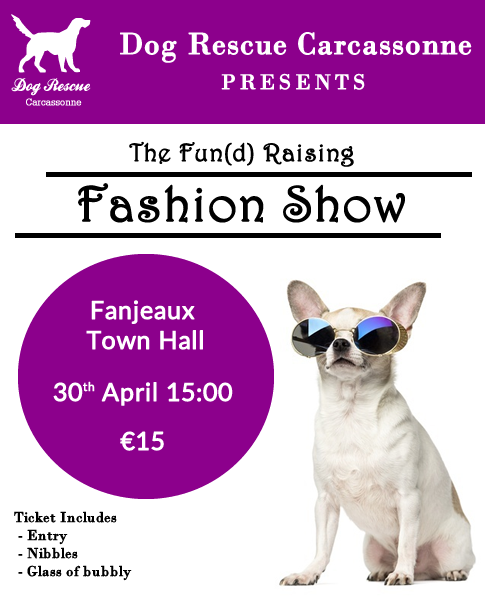 Then our 2nd Fun(d) raising Fashion Show, a charitable event in aid of Dog Rescue Carcassonne, might be just the thing for you! Due to the success of last year’s first ever SPA Fashion Show, we are repeating this popular event on Sunday, the 30th of April in the Village Hall in Fanjeaux, starting from 3pm. Giggles are guaranteed, when you watch our lovely amateur models show off some of our gorgeous second hand outfits and strut their stuff to funky disco music. There will be refreshments (some free with your entry ticket) and before and after the show you can find some brilliant bargains from our huge choice of second hand clothes and accessories. There will also be stands with cosmetics, soaps and decorative items for your home. You might even find a funky new collar for your dog! We will also have a tombola and would be very grateful if you could kindly donate a prize for the day. Tickets for the show will be available shortly at 15 EUR each. This includes the Fashion Show itself, a glass of bubbly as well as nibbles. To help with planning, we would prefer to receive payment in advance but tickets will also be available on the day at the door. Please email any of the organizers (details below) if you are interested. Do come and bring along your girlfriends to this fun event and support the DRC – we and the many abandoned dogs say a big “Thank You” in advance for helping with the most important thing in their lives, finding kindness and a loving “forever home”. Next: Adoption of Idefix and Pepito!